(Honolulu, HI)— Kulu Kulu Cake has established itself as the go-to pastry shop for “Japanese” cakes and desserts, including seasonal treats that have become popular enough to warrant a pre-order. The Signature Japanese Christmas Cake and is $38 (6”), $48 (7”), and $56 (8”). Another fan favorite is Kulu Kulu’s signature chocolate cake and is $37 (6”), $47 (7”), and $55 (8”). The irresistibly fluffy cheesecake is sure to be the centerpiece on the dessert table at your holiday party. Priced at $35 (6”), $43 (7”), and $52 (8”). This popular Italian dessert is made with 100% Kona Coffee and is $38 (6”) and $48 (7”). Shaped like a Christmas tree, the combination of the light sponge cake and distinct flavor of Green Tea Mousse is sweetened with white chocolate. Priced at $38. Also known as Bûche de Noel, the base of this cake is make with the “Best Roll Cake in Honolulu.” Priced at $37. Pre-ordering for the cakes are available starting Wednesday, November 1, in-store or online at www.kulukulucake.com, and can be placed until Sunday, December 17. Pick-up dates for Christmas cakes are between Monday, December 18, through Monday, December 25. Please keep in mind that orders placed directly at one location must be picked up at that same shop (i.e., you are not able to place an order at the Shirokiya location for a Royal Hawaiian Center location pick-up). Another favorite seasonal treat worth preordering is the osechi cake box. Osechi ryori are Japanese New Year’s ‘good luck” foods that come in unique bento boxes called jyubako. The dishes within each have a special celebratory meaning. The oscechi cake box, is a visually delightful (and delicious) play on the tradition. Each Osechi Cake box is $50 with a limit of 50 sets total. 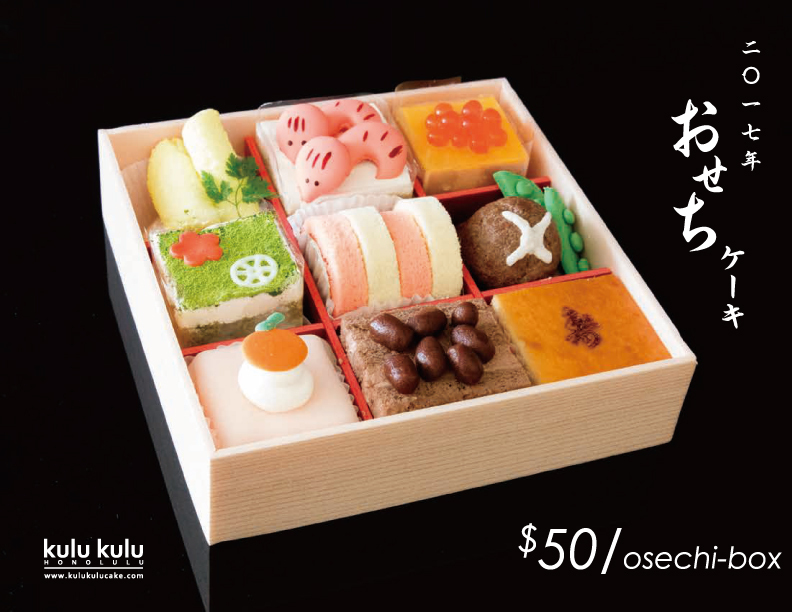 Preorders for the Osechi Cake box are available in-store or online at www.kulukulucake.com. Pick up for the cakes are available from Sunday, December 31, through Tuesday, January 2, 2017. Please keep in mind that orders placed directly at one location must be picked up at that same shop (i.e., you are not able to place an order at the Shirokiya location for a Royal Hawaiian Center location pick-up). This is an image of the 2017 Osechi Cake and does not necessarily reflect the 2018 (current) Osechi Cake to be sold. If you would like more information about Kulu Kulu or any of the products mentioned, please call Sascha at (808) 922-8974, or email her at sascha@mediaetc.net.